Or just any sturdy and cool new bag would be great! Loose the bib. If clothing protection is a must replace the bib with other options. another choice is a make-up/hair-dresser cover-up/apron or "cutting cape"
It's back to school time and here are some tips a special educator wants you to think about for back to school. return your health forms, it sounds obvious, but because so many students with severe special needs/medical fragility stay in the same class for a few years it is easy to forget that we need the forms filled out AGAIN, sorry about that! when was the last time your child's wheelchair, walker, AAC device or other equipment had a good scrub down? Follow the manufacturers directions, toss those cushion covers in the wash and give everything a good cleaning. It was 1999 and Danielle was a ten year old with cerebral palsy who was non-speaking and non-ambulatory. Although she would soon have a defined yes/no we weren't there yet. She lay on a mat in my classroom in the city and cried. We tried music, favorite toys, hand lotion and massage and even scolding her to stop. She didn't. Finally I verbally listed body parts to her from the toes up touching each one and she stopped crying when I said "do your thighs hurt?" Two days later we have confirmation of a femur fracture from previously undiagnosed brittle bones. I filed away the memory of connection between the unusual behavior and the student being in pain. In 2004 in a classroom for high school students in rural New England a young man, Chuck, with multiple disabilities including spastic quadriplegia, communication impairment and hearing impairment refused to transfer from his manual wheelchair into his power chair. We argued, I insisted and he went off to his job in the community. The next day the refusal to transfer chairs happened again. Danielle came to mind and I asked if he was in pain. He nodded. It turned out his seat cushion had popped, all the gel had leaked out and he was sitting on a metal plate. I again filed away the memory of the connection between unusual behavior and pain. Recently, in a classroom nearly 60 miles from that classroom in rural New England another young woman with profound, multiple disabilities was crying every day, during every transfer and every slight shift in positioning. She was unable to indicate in any way what the tears were about. A few days passed and some people questioned if the behavior was manipulation. 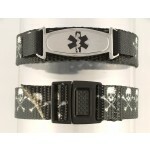 Danielle and Chuck entered my mind and I asked the nurse if we could try giving her some Tylenol just to rule out pain. The next morning we did just that and to our thrill not a tear was shed all day and for the first time in weeks the student was able to participate in active PT exercises! I wish there was some way I could thank Danielle and Chuck (and all my other students) for teaching me that all behavior is communication and that sometimes that communication is simply, "that hurts!" 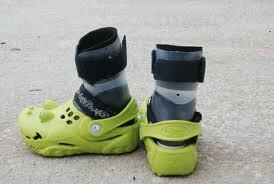 Here's a tip passed on by a parent - Crocs can work great with AFO's (leg braces)! They stretch a bit to get on, are generally a little wider than other shoes and are cool too!